Fact-Checking NPR's Reports On Vegas 'Violence' : NPR Public Editor Were chairs really thrown at the Nevada Democratic party convention? 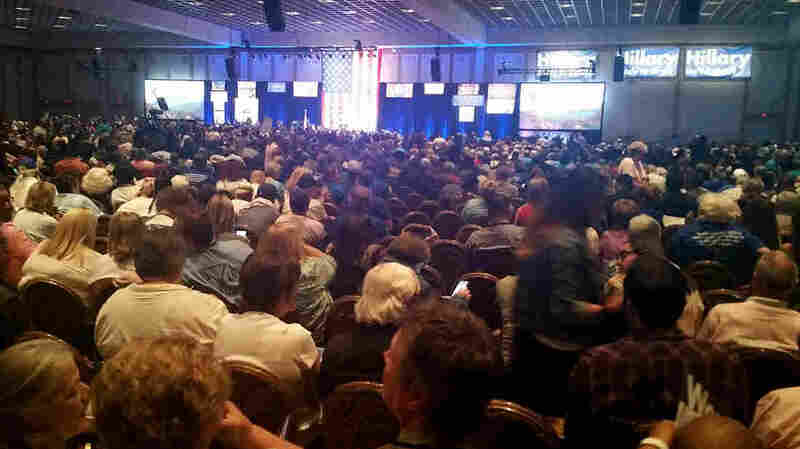 Thousands of people gather at the Paris Hotel in Las Vegas for the Nevada State Democratic Convention on May 14, 2016. NPR's use of the word "violence" and claims of thrown chairs in recent stories about Saturday's Nevada Democratic Party state convention have come under criticism by supporters of candidate Bernie Sanders. "In the aftermath of the convention a single report of 'throwing chairs and rushing the stage' by an openly partisan 'journalist' became the story for every major news outlet. In particular, the dramatic image of 'throwing chairs' seemed to strike reporters as great stuff; so it was repeated. As far as my extensive research can determine (and I am still looking) there is no other evidence of 'thrown chairs'. This one counterfactual account changes the tone of stories containing it dramatically. If it did not happen, claims of 'violence' which depend on it are simply not sustainable." A number of listeners and readers have written with similar concerns (not all so polite). The reports they are concerned about include this one from today's Morning Edition, with the headline, "Nevada Incident Could Make It Difficult For Sanders' Supporters To Back Clinton" and yesterday's online-only story, "Bernie Sanders Defends Supporters After Rowdy Protests In Nevada." "But chaos followed after Sanders supporters allege they were denied being seated at the convention and that the state party chairwoman, Roberta Lange, was slanting the rules in favor of Clinton. In the end, Clinton ended up with 20 delegates out of the state to Sanders' 15. Sanders supporters, believing they had been treated unfairly, rushed the stage, threw chairs and were shouting obscenities, according to veteran Nevada journalist Jon Ralston. Even after the convention concluded, many refused to leave and had to be escorted out by security." As Sloman notes, other outlets, including The Associated Press, also reported that chairs were thrown. While I have no reason to doubt that reporting, in the extensive video posted on social media in the aftermath of the convention I've so far found none of a chair being thrown. One video shows a chair being lifted in the air. Other videos do show angry Sanders supporters rushing toward the stage and shouting obscenities. Talking Points Memo this afternoon tried to get to the bottom of what happened and the report was inconclusive: "There has been disagreement between Sanders supporters and those critical of their behavior Saturday over how violent the state convention actually was, and who is to blame. Descriptions of the day's events recount shouting, interruptions, crude names and epithets being lobbed at party officials, and an evening that culminated in a group of Sanders backers rushing towards the stage and even flipping chairs. Only some of those incidents could be backed up by video evidence posted by those at Saturday's convention and other reports." Donovan went on, "So, was there violence? There was pushing, shoving, and screaming, a chair was brandished and a great deal of hostile and obscene language used. Several editors and reporters saw and heard the video live and later. People on the ground described it as violence. It doesn't seem a stretch to me." Donovan and I disagree on this; "violence," which NPR more often uses to describe events in war zones, seems too strong a term to me based on the evidence I have seen so far. And the politics team's own decision to avoid the word "thrown" renders this online-only introduction to Keith's piece misleading, unless other eyewitnesses come forward to clarify the events: "Sen. Bernie Sanders is answering for violence at the Nevada Democratic Party's state convention, where his supporters threw chairs and hurled obscenities as Hillary Clinton claimed the most delegates."